Remember when Fargo claimed it was based on a true story despite the fact that it wasn’t? This movie claims it’s a parody. I found this mostly funny with some dry patches sprinkled throughout, and I know that review sounds like a weather forecast but I'm too far in to change it now. The cast is great, especially Capaldi. It's like the thick of it but in a movie format. if you like Veep, you'll love this. I do not like Veep. The writing of Armando Iannucci, Simon Blackwell, and more in combination with performances from actors like James Gandolfini make In the Loop one of the best modern political satires. It pokes fun at politicians, their interns, and the self-importance of the process as a whole. It's unfiltered and to be honest, that's undoubtedly part of why I love it so much. If you like this film, check out his TV series, Veep, too. Mar 07, 2017 ??? ???????? 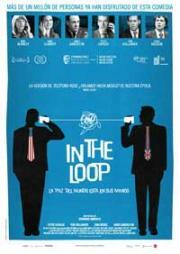 IN THE LOOP is a biting political satire with a plethora of quotable moments, a bevy of wonderfully acerbic performances, and the narrative discipline of a wet linguine noodle. Chaos is very much the point, and it smartly sends up the way politics is played to give the illusion of forward momentum. But, I dunno, it just kind of...ends? Armando Iannucci's vision is made for TV--as his splendid shows attest--and this is merely a fun distraction.